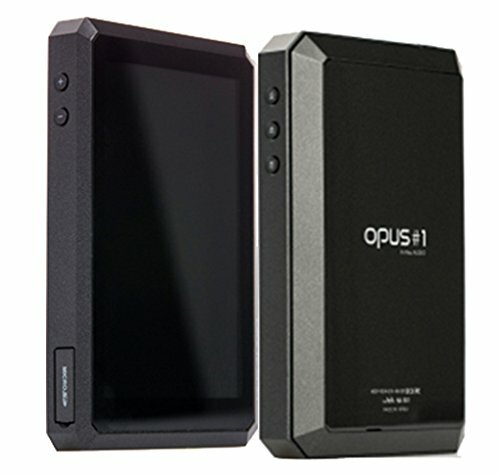 What is the Opus #1 High Res audio Player? The Opus #1 is a new entry into the ever more competitive HD music player market. In years past audiophiles would walk about with rather crude "stacks", piling portable amps and DAC's on top of an iPod in search of the best musical fidelity. Those were some fun times but this also lead to a world where being an audiophile was kept firmly as a niche hobby, one confined to online forums like Head-Fi. In many ways it still is but, with the rise of the High-Resolution DAP (Digital Audio Player) in the past few years, things have changed. Now instead of building our own higher grade circuitry (usually a mess of cable and boxes) many audio brands are now committed to creating premium all in one audio devices. The latest device to enter the market is the Opus #1. A touchscreen music with dual Cirrus Logic DACs and a Quad Core Arm A9 processor priced at $599 in the US right now sounds great. However, the brand is still relatively unknown and they have set themselves up to do battle against long established audiophile brands such as Astel & Kern, Fiio and Sony. That's a big ask for any company but having heard so many good things about Opus we had to try it out and give it a full review. So is the opus #1 the giant slayer it is purported to be? You'll just have to read on to find out. Packaging on the Opus #1 is pretty basic but still nicely done. A simple sleeve over a top open box. There ain't much fanfare but the graphics look clean and stylish. Pop open the box and you get your first look at the player which sits front and centre. Underneath is where you find the accessories of which there are very few. A screen protector, user manual and USB cable are all you will find. I would have liked to have seen some sort of carry case included, maybe a cheap silicone case or bag would have sufficed. However, I do know that Opus also have a custom leather carry case which retails for an extra $50. Personally, I would go ahead and grab one anyway but it is a shame something isn't included in the box. Realistically other than a case there is not much you can include with these sort of music players as including a set of headphones will only drive up the price and will most likely never see any use. The Opus#1 feature a large high resolution touch screen interface making browsing menus super easy and far more intuitive than that of conventional hardware controls. I really wish more music players worked as well as this. When listening to my music from any digital audio player the last thing I want to do is be digging about through menus and sub menus. Running a customised version of android is a was a wise choice as opposed to using some obscure 3rd party software. The large screen allows the Opus to display a lot of information and menus and file systems were a breeze to navigate. You will spend most of your time either the playback screen or the menu/file screen and both are laid out perfectly. When searching for music you find yourself in a scrollable list and at the bottom a number of tabs letting you order you files by track, album, artist, genre. Scrolling is super smooth and the responsiveness of the firmware is excellent no freezing, no hiccups and even with over 160gb of Flac and MP3 formated files the player scanned my music in just a couple of minutes. Sub menus such as brightness settings and Eq customisation are all very easy to get with and operate on a slider system to letting you tweak your player to your own personal needs. Battery life is pretty average and no doubt a drawback of having a large display. I found I wass getiin around 9-10 hours from every charge making it fine for a days use but in doing so you will be charging daily. We are now getting to the stage where a lot of Hi-Res audio players are beginning to look very much the same. Just like the smartphone industry, where a large touchscreen limits the styling option to subtle variations of rectangular blocks, the DAP industry has followed. From a distance, you might mistake the Opus #1 for Astel & Kern with its angular edges or even Onkyo's DP-X1. Construction is excellent with the frame being constructed of very high quality textured plastics whilst the front and back are swathed in glass. This combination helps to reduce scratches and at the same time make it resistant to slips. The sides of the device have some handy buttons that allow you to take control of the music playback and volume without using the screen. Now for a few of the Opus #1's hardware tricks. As well as having 32gb onboard storage you have not one but two microSD slots allowing you to store extra 400gb worth of files. That's crazy and something most welcome if you store you music files in Flac, WAV, DSD and 320kbps MP3 as I do. Internally the player runs 2 Cirrus Logic CS4398 DAC's. This is the same DAC setup that you will find in Astel & Kerns AK240 that costs an eye-watering $2500. All this is powered by a 4000mah battery which, unfortunately, is not user replaceable. The final thing of note is the range of option included to output your music. Of course, you get the standard 3.5mm headphone out but you can also set the Opus up with balanced and optical devices. of course to utilise the full benefits you will need to have specialised Hifi equipment or headphones but it's nice that we are now getting the option. One thing that really stands out from listening to the Opus #1 for any length of time is that the soundstage is massive. One of the biggest I has heard from any portable audio player. Extremely open and displaying huge amounts of width and depth this makes it perfect for live recordings and works wonders with rock and electronic music. The #1 is also very, very neutral, making it as good for critical listening as it is for sitting back relaxing and letting you speakers or headphones do the work. Comparing it directly to the Questyle Qp1r everything flatter in the frequency and there isn't any additional warmth added to the signature. It's definitely what I would refer to as reference quality. Pairing with any of my headphones seemed to be a breeze as the Opus #1 has the ability to drive even my most sensitive IEM's without adding an artificial layer of hiss that you can find in other high-end players. While I mostly used the Opus with the Campfire Audio Andromeda IEM's and I highly recommend this pairing the match that sounded almost unreal was with the Final Audio Design Piano Forte VIII. These earphones have a soundstage that can rival some full-size cans and put them it together with the Opus DAP only made things that much sweeter. Detail retrieval and imaging are another reason you are going to want to buy an Opus #1. You really fell you are getting all the detail. Whether it be a gentle dampening of the foot pedals on piano strings or a cord press on acoustic guitars or the parting of a singers lips on vocals. You hear it and those nuances make listening to your music more enjoyable than ever. Well yes to be quite honest. Wifi and the ability to connect the player to streaming services such as Tidal and Spotify. It's also understandable why in hasn't been included. Wifi is a huge drain on the battery and for a player that only gets around 9-10 hours to start users may struggle to see a full days usage. However the ability to store 400+ GB of music more than makes up for that right now but it is something I would like to see if the company ever decides to make an Opus #2. Opus #1 Review - Conclusion - Is this the sweet spot? The Opus #1 is a beast of a digital audio player. The interface is robust, snappy and incredibly easy to use. Storage capacity is up there with the best. Hardware is top notch. The sound is detailed, neutral and offers one of the biggest soundstages we have ever heard on a portable device. Everything about it screams of what audiophiles have been asking for. Sonically it can put more expensive players to shame, feature wise it will also punch well above its $599 price tag. To me, this is a no brainer, if you are in the market for a top quality DAP right now then this is probably the one you should buy.